Diskeeper Home Edition is a hard drive defragmentator for the Windows operating system. It doesn't differ too much from the other versions produced by the same company and offers a quick and painless way to make your computer run just that extra bit smoother. Disk defragmentator can also be run automatically by configuration. 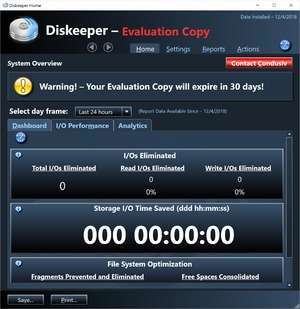 For security reasons, you should also check out the Diskeeper Home download at LO4D.com which includes virus and malware tests. Additional screenshots of this application download may be available, too.